The Ultimate Collection of Add-ons for DOOM Fanatic! 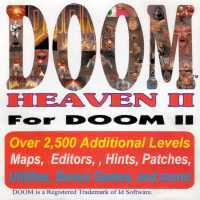 Each CD contains over 2,500 additional levels for the "registered" version of DOOM - no other CD provides you with as many levels. Features a state of the art Menuing System with full mouse and SoundBlaster support and DOOM Launch (a customized DOOM WAD manager). Contains: Add-Ons, Cheats, Demos, Editors (create and change levels), FAQs, Hints, Loaders, Maps, Menus, Patches, Shells, Sounds, Utilities & Tools, Weapons, BONUS Games and More.